If the lights go out and your regular emergency supplies are not available, what can you do? Well, if there's a stick of butter in the fridge, you're halfway to a serviceable candle. Is it a MacGyver-style party trick or a practical skill for managing power-outtage emergencies? We’re not positive, but we think it could be both simultaneously. Here’s what you need: A stick of butter, a knife, a toothpick, and a piece of toilet paper. That’s it. The steps involved in actually creating the butter candle are similarly few. First, halve or quarter the stick of butter so that you end up with a four-tablespoon pad (with the paper attached). 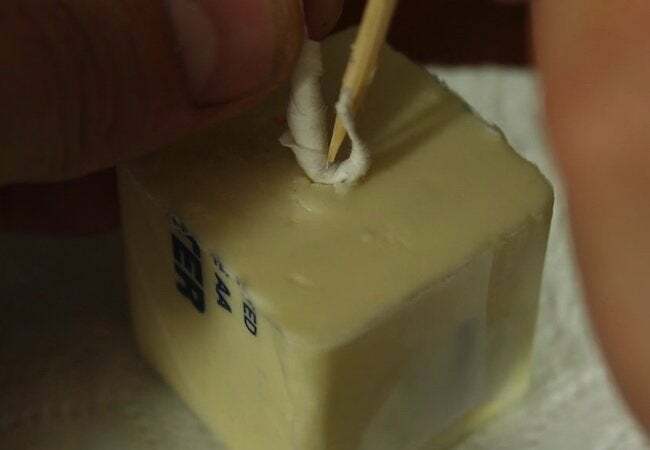 Next, using a toothpick, poke a hole through the exposed face of the butter, plunging the toothpick all the way down through the stick so that it pierces the paper wrapping at the bottom. To complete the candle, twist a piece of toilet paper into a tight coil. Once finished, fit one end of the coil through the channel that you burrowed through the butter. Using the toothpick if necessary, coax the makeshift wick through the butter until the tip peaks out of the paper-wrapped bottom side. If the top end of the wick measures much longer than a quarter-inch, simply tear off the excess material. For safety’s sake, set your candle on a plate before you finally light it. 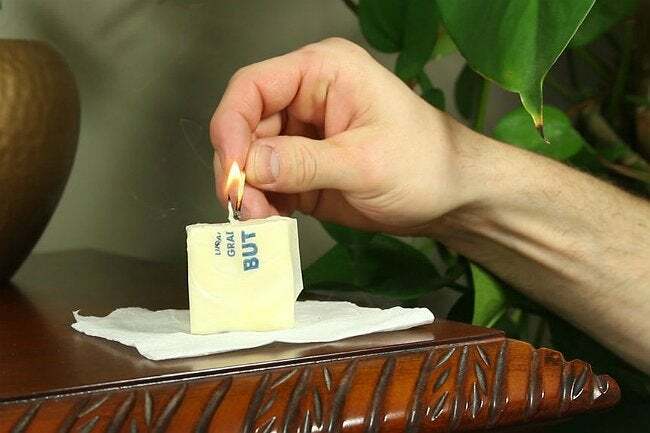 According to Instructables user The King of Random, a four-tablespoon stick of butter prepared in this way can burn for as long as four uninterrupted hours!